S’il y a un lien entre le suicide d’A. Swartz et les poursuites dont il faisait l’objet, il sera le premier martyr du Domaine public. Personnellement, je ne sais pas si l’on peut faire d’Aaron Swartz le “martyr” d’une lutte pour la libération des biens communs de l’intellect humain du joug commercial. Il était une figure relativement inconnue par le grand public, et sa mort demeure un événement profondément personnel, intime, enraciné dans son vécu et dans son ressenti (cf. ce vieux billet de son blog dans lequel il parle de sa dépression). Pourtant, comme le rappelait Antonin Artaud en évoquant Van Gogh, “on ne se suicide pas tout seul”. Les convictions d’un suicidé, ainsi que les pressions sociales exercées sur sa personne, ne peuvent jamais être évacuées du tableau. Ce qui est certain, alors, c’est que la mort d’Aaron Swartz jalonne et se fait miroir d’un processus historique de prise de conscience de l’étendue et des conséquences politiques et sociales de l’exploitation commerciale de la recherche publique. 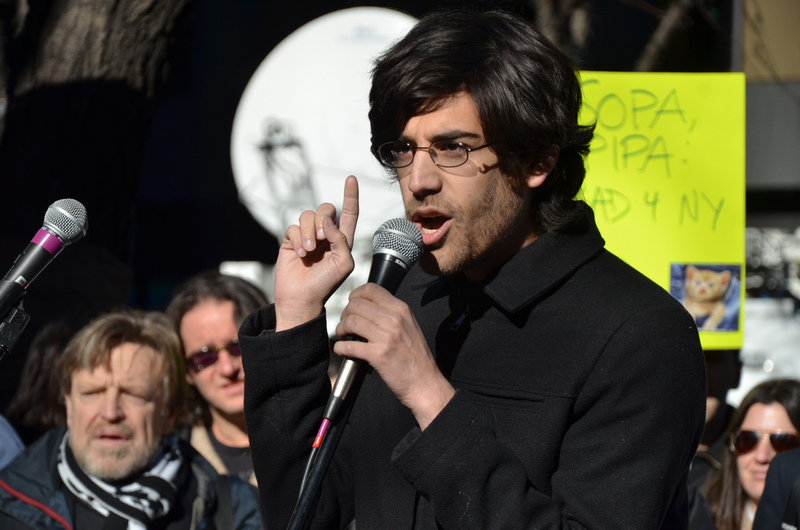 The sad news was delivered at 2:15 AM 12 January, 2013: activist and computer programmer Aaron Swartz has passed away. The reasons for his action are as yet shrouded in mystery. But some already link this suicide to the lawsuit that the US Attorney for the District of Massachusetts had started against him in 2011. The charges? Having downloaded from a MIT server and made available almost 5 million scholarly articles which were commercially distributed by the online portal JSTOR. A case of academic hacking or the manifestation of a radical approach to the liberation of the fruits of scientific research? Indeed, Swartz was possibly facing up to 35 years in prison. The young programmer always protested his innocence, but was unable to avoid being turned into the poster boy for the Guerilla Open Access, a civil disobedience movement advocating collective reappropriation of scientific information, bypassing by any means necessary paywalls and other artificial barriers to access created by commercial publishers. 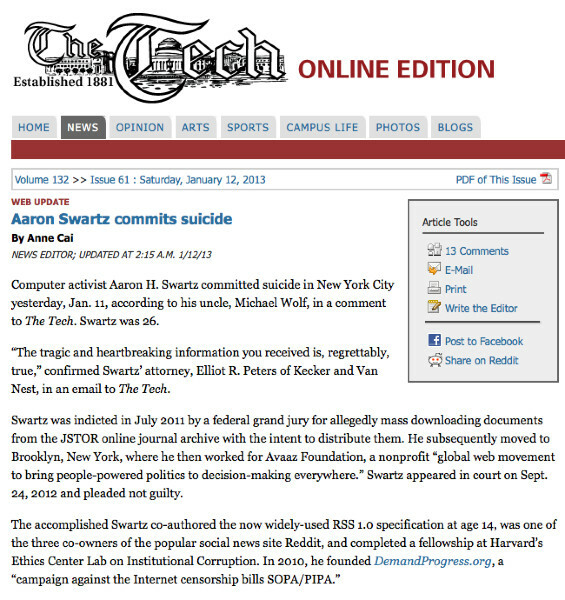 “If there’s a link between the suicide of A. Swartz and the felony counts he was charged with, this would make him the first martyr of Public Domain” [Translation of a tweet by @calimaq, January 12 2013]. Personally, I do not know if Aaron Swartz can be described as a “martyr” for the liberation of human knowledge from the yoke of commercial exploitation. He was relatively unknown to the general public, and his death remains a deeply personal, intimate event, rooted in his own experiences and feelings (see this old post of his blog in which he talks about depression). However, as pointed out by Antonin Artaud while discussing Van Gogh’s death, “we do not commit suicide alone.” The beliefs of the persons who commit suicide, as well as the social pressures exerted on them, can never be dismissed as irrelevant. What is certain, then, is that the death of Aaron Swartz mirrors a historical process of awareness-building about the pervasiveness and social consequences of the commercial exploitation of academic research.